Take a cutting-edge browser, and add a Seventies-era user interface. This crazy-sounding idea stands at the core of Pentadactyl (free), a Firefox add-on that makes Firefox look and feel like the famous open-source text editor Vim (and, to an extent, Vi, the editor that preceded it and was initially released in 1979). If you've ever wanted to use Firefox for hours without reaching for your mouse even once, this may be the add-on you need. 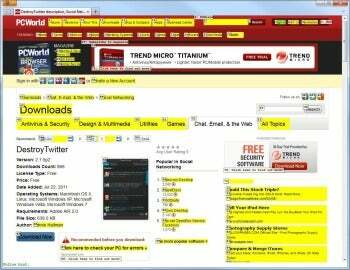 Pentadactyl provides powerful, fast auto-completion. If the concept sounds familiar, that's probably due to the well-known Vimperator, a Firefox add-on that does exactly the same thing. In fact, Pentadactyl is Vimperator, under new management. The original Vimperator add-on is still alive, but Pentadactyl was forked by some of its former developers due to disagreements with the project lead. There are some changes, the most notable of which is a major improvement in startup times. Heavy Vim users may care about some of the other changes ("It is now possible to skip past the end of incomplete completion groups via the c_ and c_ keys"), but for the rest of us, just coming to grips with Pentadactyl's basic functionality is challenging enough. If you're not already a Vim user, Pentadactyl is probably one of the most confusing things that can happen to your browser. Unlike Vimperator, installing Pentadactyl doesn't require a browser restart. You just click the Install Now confirmation button, and find yourself with no address bar, add-on bar, or any other bars for that matter. You're suddenly left with a bare window that contains almost no browser chrome--just tabs on top. Welcome to Pentadactyl. Thankfully, the Pentadactyl Help system immediately pops open, so you can just start reading to figure out how things work now, and the first thing explained is how to bring the toolbars back (although they suggest you keep them off). 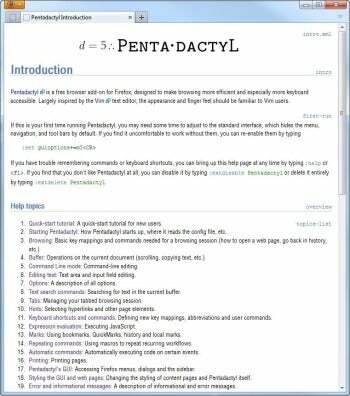 Pentadactyl's online help is comprehensive and well-written. Even if you're already familiar with Vim, you may still want to read the documentation. Pentadactyl stays very true to the spirit of Vim, and the way it is extended to support functions that are available in a browser but not in a text editor makes a lot of sense. For example, a new :dialog ext command lets you open Firefox dialogs (try :dialog addons for the Firefox add-on dialog). Pentadactyl also has a very fast autocompletion system for ex commands, so just typing :dialog and hitting Space pops up a list of all dialogs you can access using this command. One problem with Pentadactyl is that because it remaps so many keys, websites that use shortcut keys--like Gmail and other Google products--may not play well with it. Pentadactyl resolves this by offering a "pass-through" mode that passes all keys except Escape directly to Firefox. You can trigger it manually, but if you want it to always trigger when you switch to Gmail, you need to configure Pentadactyl for it. Even after doing this, the J/K keyboard shortcuts used in Gmail still didn't work for me. Pentadactyl's hint mode lets you navigate without using a mouse. Much like Vimperator, Pentadactyl lets you click links without reaching for your mouse. It does this using "hints:" hit f, and all links on the page become highlighted, and a little number pops up next to each. You can either type in that number, or start typing the anchor text of the link. By the way, if you like this functionality but are not looking for full-on Vim emulation, you may want to check out LoL--a free Firefox add-on that does just this. Pentadactyl also has an extended hints mode that can be used for performing other operations with links. Let's say you want to copy where a link saying "funny picture" points to. Normally, you would have to reach for your mouse, point at the link, right-click to open the context menu, and click Copy Link Location. With Pentadactyl, you just have to type ;yfunny and hit Enter. Such is the power of Vim, and by extension, Pentadactyl. If reaching for your mouse sounds like the sensible thing to do, Pentadactyl is not for you. But if you're already using Vim, are fascinated by arcane keyboard shortcuts and infinitely configurable interfaces, or just really dislike toolbars, Pentadactyl can transform your browsing experience. Based on the Vim interface, Pentadactyl for Firefox lets you browse the Web without a mouse.